Forgotten! Oy! Only 100 years after his death at 63 in Warsaw, Poland from a heart attack, one of the most creative writers of Jewish short stories is barely remembered today. I see this in my own experience presenting stories by Peretz, Sholem Aleichem, Sholem Abramovitsh, and Jacob Dinezon to Jewish audiences. Only Sholem Aleichem, the writer of the Tevye stories, receives a glimmer of acknowledgment—and often only after a little prompting with a verse from the musical Fiddler on the Roof. Peretz’s skill at taking what at first appears to be a simple folk tale and turning it on its head with a modern twist, is still powerfully effective today in stories like “If Not Still Higher,” “Bontshe Shvayg” (“Bontshe the Silent”), “The Three Gifts,” and “What Is A Soul?” Stories that remind us that, though our homeland, fashions, and technologies may have changed over the years, our fundamental Jewish values have not. 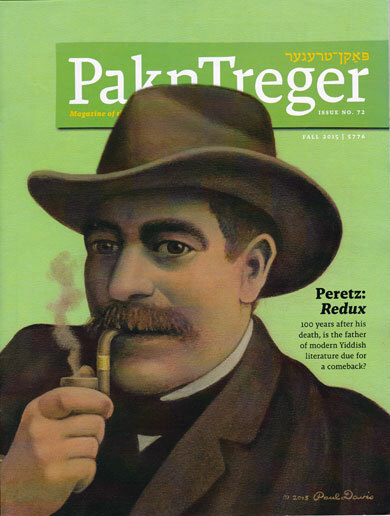 Lansky sums it up beautifully: “Peretz was creating the next stratum of Jewish literature, a body of works both audaciously modern and authentically Jewish.” I. L. Peretz is a writer who must not be forgotten.